Why Are Our Dogs Getting Fatter? Our dogs are getting fatter. And the fat ones… well, they’re getting even fatter. 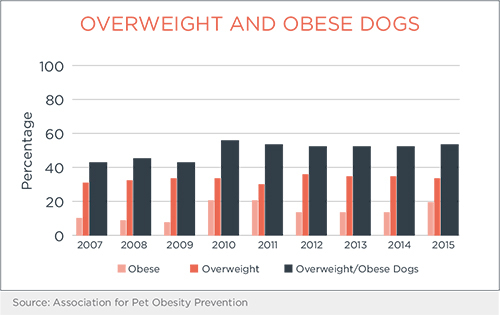 Sadly, those have been the trends — for the most part — since 2007, when the Association for Pet Obesity Prevention conducted its first National Pet Obesity Awareness Day survey. At its simplest, the prevalence of overweight dogs can be easily explained: too many tasty foods and treats, worsened by genetics (for some dog breeds), too little activity and overfeeding after neutering or spaying. The solution seems equally easy: Feed less food, give fewer treats and move more. But if keeping our canine companions at an appropriate weight is so simple, why are more than half of U.S. dogs overweight and obese? We humans are the main cause of canine obesity — by consistently overfeeding our dogs, giving them too many treats or leftover table food as proof of our affection, and not exercising them enough. Even worse, many of us aren’t aware there’s a problem with our pet’s weight. We think our overweight or obese dog is a normal weight. Table scraps, treats and even premium, calorie-rich dog foods — all of which can be very tasty to our dogs — can contribute to obesity, especially when too much is fed repeatedly or offered free-choice. Some dogs do well if fed free-choice because they’ll eat only what they need. Other dogs, however, will eat everything available and then scavenge for more. So the amount of food available and the dog’s eating tendencies can determine how likely it is that a dog will become overweight. That’s why many veterinarians recommend feeding our four-legged friends measured portions, preferably twice a day. When it comes to treats, many dog parents aren’t aware how many calories can be packed into a tiny tidbit. And how many of us stop at giving just one treat? According to Ernie Ward, DVM, and founder of the Association for Pet Obesity Prevention, “Treats are the silent saboteurs of the most reasonable, balanced, nutritionally complete diets.” In other words, if dog owners aren’t careful, too many treats undermine an otherwise healthy diet while adding a substantial number of calories — and unwanted pounds. As a rule of thumb, only 10 percent of a dog’s daily calories should come from treats. It’s okay to treat your dog, but consider alternatives: baby carrots, pieces of his regular kibble, another walk or game of fetch, or breaking large treats into smaller pieces. A dog’s activity level plays a key role in determining his energy (calorie) needs and, as a result, the likelihood he’ll become overweight. Just as with people, an active dog uses more calories than an inactive one. Also, an active dog is less likely to be bored and to eat just for something to do. The amount of exercise your canine companion needs depends on his breed, age, size and general health. Veterinarians generally agree that 30 minutes to two hours a day of exercise is necessary to keep your four-legged friend fit. If you’re not sure how much activity your dog should be getting — or is fit enough for — be sure to talk with your veterinarian. Does spaying or neutering make your dog fat? No, although there is a connection between reproductive status and the number of calories a dog needs. Neutering and spaying slow a dog’s metabolism, and the loss of key hormones can affect activity level and appetite. That’s why neutered and spayed dogs typically need fewer calories or more exercise to maintain a healthy weight. Yes, some dog breeds are more likely to become overweight. Earlier this year, University of Cambridge researchers found some Labrador retrievers and flat-coated retrievers have a gene mutation that causes them to be more food motivated and to weigh more than those dogs without it. So if your canine companion is a Labrador retriever who pesters you frequently for food and treats, it may be that he’s genetically hard-wired that way. Other dog breeds predisposed to obesity include cairn terriers, West Highland white terriers, Scottish terriers, Shetland sheepdogs, basset hounds, Cavalier King Charles spaniels, dachshunds, beagles and cocker spaniels. Just because a breed may be prone to extra weight doesn’t mean all dogs of that breed will actually become fat. But it does mean you’ll need to be especially diligent about monitoring your canine companion’s weight. The negative effects of obesity are more complicated than carrying around extra pounds. Associated health risks can include diabetes, arthritis, heart disease and others. For most overweight dogs, a combination of free-choice feeding, boredom and not enough playtime is the root cause, which comes back to us as pet parents. The good news is that it’s not too late to reverse the trend of increasingly fat dogs. Hopefully, the 2016 National Pet Obesity Awareness Day survey will show the beginning of a new and downward trend.